We are only two months in to 2018, but it has already been pretty exciting from an automation standpoint. Let’s review some of the big news. Microsoft open-sourced and released PowerShell 6.0. They also made it available on a number of operating systems, from Windows to Linux to Mac OS. Then, PowerCLI hit 2,000,000 downloads from the PowerShell Gallery! Today, we are releasing VMware PowerCLI 10.0.0! Let’s talk about the version change for a second. If you’ve been a PowerCLI user for a couple years, you have probably noticed quite the transformation here recently. One item of note was when the name was changed from vSphere PowerCLI to VMware PowerCLI. This was due to PowerCLI’s ability to manage more than just vSphere. With this release, we are taking that next step to remove ourselves from being in lockstep with vSphere’s versioning. Why did we go with 10? Well, PowerCLI recently celebrated its 10th birthday so it seemed like the perfect number! Time to take a look at everything that’s new! Future releases of PowerCLI will continue to add support for the remaining modules. This version changes the way certificates are handled when connecting to a vCenter server or ESXi host with the Connect-VIServer cmdlet. If your connection endpoint is using an invalid certificate (self-signed or otherwise), PowerCLI would previously return back a warning. The handling has been updated to be more secure and now return back an error. If you are using an invalid certificate, you can correct the error with the ‘Set-PowerCLIConfiguration’ cmdlet. The parameter needing to be configured is ‘InvalidCertificateAction’ and the available settings are Fail, Warn, Ignore, Prompt, and Unset. These cmdlets are replaced with the use of the Invoke-VMScript cmdlet. $netsh = "c:\windows\system32\netsh.exe interface ip set address ""Local Area Connection"" static $ipAddr $subMask $gw 1"
Today, we release PowerCLI 10.0.0. This release adds support for PowerShell Core 6 which can be run on Linux and Mac OS systems. There are also a handful of VMGuest related cmdlets which have been removed from the release. Their functionality can be replaced with the usage of Invoke-VMScript. Lastly, there have been several corrections. Many of which are thanks to our amazing community for bringing them to our attention. For more information on changes made in VMware PowerCLI 10.0.0, including improvements, security enhancements, and deprecated features, see the VMware PowerCLI Change Log. 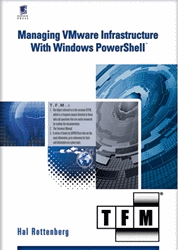 For more information on specific product features, see the VMware PowerCLI 10.0.0 User’s Guide. For more information on specific cmdlets, see the VMware PowerCLI 10.0.0 Cmdlet Reference. This entry was posted in General and tagged PowerCLI, PowerShell, What's New on February 28, 2018 by Kyle Ruddy. The VMware PowerCLI Change Log is not updated yet with VMware PowerCLI 10.0.0 information. When we use the “Update-Module VMware.PowerCLI” command it downloads the new version and keeps the old versions installed. There is a way to update a module removing the older versions of it? Thanks! I’ve added the “-Force” parameter to my script of module cleaning. Does the new cert requirement work with internal CA’s. I have a trusted cert on my server, but still get an invalid cert error when attempting to connect the client. Good to know I am not alone. Would love to know what they come back with. Is there a package/offline installation option? i’m having no success from behind proxy despite other functions and access from Powershell 6.0 working. This! Jeez, just give us a download link! Guessing the problem is ‘Security’ is typoed? I am having the same issue except only when I attempt to connect to a VCSA 6 server. I have no issue connecting to VC 5.5. Doh! I didn’t pay close enough attention to Vandrey’s comment–the dumb Update/Install-Module commands are basically doing nothing; I’ve still got *ONLY* 6.5.0 after both commands. @#$#@#ing PowerShell! I’ve tried running the command multiple times. This is a new install of PowerCLI with no previous installations. The modules are there when I list them as well. I have not been able to get this to work since it was released. I am running PowerShell 5.1 and PowerShell 6.0 (Core) on my machine. In 5.1 I get an error where the log4net assembly fails to load, and on 6.0 I am presented with VMware.VimAutomation.Srm module is not currently supported on the Core edition of PowerShell. I’m pulling my hair out trying to get this to work, and am now at the point of fallback to 6.5.4. I really don’t see how this made it to a shipped version since it doesn’t work with either version of PowerShell that I have for Windows 10. I am unable to get this to work with PowerShell 5.1 or PowerShell 6.0 (Core). In 5.1 I fail to load log4net, and in 6.0 it fails to import VMware.VimAutomation.Srm as it’s not supported. I’m falling back to 6.5.4, which is really unfortunate. Nothing about 10.0 works for me in Windows 10. Ensure your antivirus isn’t blocking the install. 95% of the time with these issues, AV is blocking the DLL. Outside of that, feel free to open a support ticket. Second issue is why -scope current user? This just installs the module for one user (.\Documents\WindowsPowerShell\Modules). Can we use allusers, so it installs to C:\Program Files\WindowsPowerShell\Modules? There may have been an issue with the PowerShell Gallery if that’s all you received. Remove the modules (Get-Module VMware. * -ListAvailable | Uninstall-Module OR delete the module folders from your $PSHome directory) and attempt the install again. Second part, certainly. You just need to open your PowerShell session as administrator first. Did you happen to add “-Scope CurrentUser” to the command? Having to sudo means you probably installed PowerCLI for all users on that system. you’re right, i purged as sudo, then tr-tried with curtentuser which worked. Import-Module : VMware.VimAutomation.HorizonView module is not currently supported on the Core edition of PowerShell. Wow. I tried to get PowerCLI 10 working on PowerShell Core on a Linux system a few weeks ago, and even tho I got it running I was unable to benefit from it because all I use PowerCLI for is Autodeploy configuration. Now, I just updated my Windows management station to PowerShell Core (because I borked something else up) and found out I can’t use PowerCLI for Autodeploy configuration there as well. So, the only way to manipulate Autodeploy configurations is with PowerCLI (I’m not at vSphere 6.5 yet) and VMware.ImageBuilder does not support PowerShell Core EVEN ON WINDOWS. Seems like this release could have waited until ALL the functionality was available for at least one platform. In my opinion, this is an Epic Fail, and makes me wish I hadn’t chosen Autodeploy at all. Hi guys, i have this problem , anyone has the same ? cmdlet. Are you sure you want to install the modules from ‘PSGallery’? VMware.VimAutomation.HorizonView module is not currently supported on the Core edition of PowerShell. Epson printer is offering reliable solutions to the users via Epson printer customer service as it understands the trouble and frustration a user has to go through. It is offering solutions via different sources so that the user can select the right one according to his preferences. Your website is so cool. it’s very informative and useful for us. it has superb information to read. thanks a lot for this. See how to set up your email account and fix issues with email access. Also easily reset your password or get a username reminder online. BT Email is the optional free email service that comes with BT Broadband. When you register for BT Broadband we’ll ask if you’d like a BT Email address to use.